Oh I will look into that! I got a work around using the dye chickens to lay the naturally spawning eggs so that I could get started with it. It seems the mods I have in my modpack over power the chickens that spawn from this mod. But work arounds are always good! Can you make it for my version? is it possible to disable the stats for chickens? I don't really want to go through the high level breeding. just breed them for what I need. I got an really heavy weight problem right here. I'm the modder of an pretty big server but on the server no modded animals spawn what can i do? I don't manage servers in the slightest.. so Id be the wrong person to ask. but can you make a Gravel Chicken? 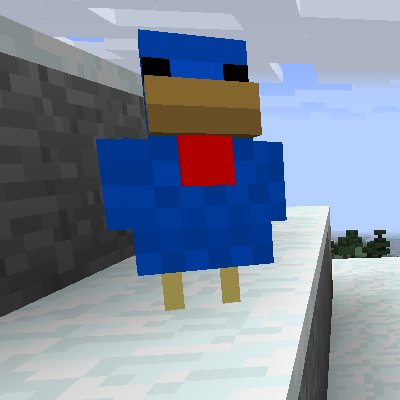 I play Skyblock with only Chickens, more Chickens, JEI, TOP and want to get Concrete! I had a crash and now I can't even get in the world - I'd really like to not lose this world because I've put quite a lot of work into it :c I'm not really good at reading crash reports but I think it's maybe because a type of chicken spawned in that my game didn't like. I know it wasn't a block because I passed by the area once before and it was fine, but turning back around is when it crashed. Should I upload the crash report somewhere and link it? Or what would you prefer? Well WAILA hasent updated to 1.12m is there any chance you could fix it to work with HWYLA? just so you can see the tier on the eggs and on the chickens, cause it is a pain to get a chicken, breed it, and then guess what egg is the best and let it hatch, only to not be the best, so please fix? or wait for WAILA, and will you add Applied Energertics to the list of mods? I really love this mod and played quite a lot with it. Since there are quite a few tricks to get even more out of it, I have made a little video showing my favourite tricks for Chickens & Hatchery. This is the some of the best tips and tricks I have seen. I hadn't seen anyone put all this together before. I knew of a lot of these tricks, but some are new. Thanks for this, I will add these to the descriptions of hatchery and more chickens. It was like that in 1.10, but has since changed. It was never intended for ppl to just get dye chickens to 10/10/10 and than each chicken afterwards is always 10/10/10. Crossbreeding no longer carries stats I believe. But this was changed before I joined. I haven't fully look at the code. Ahh I see. I wasn't sure if I was remembering wrong, if it had changed or if there was a mod conflict since I'm also using More Chickens and Roost since Hatchery isn't out for 1.12 yet. Thanks for the response! Can we have this back as a config option?